Mikey is in his basement apartment in April’s building writing in his journal when Klunk the cat comes to visit him. Mike picks up his pet and heads into the living room, where we see Donatello’s body floating in a huge tank with various tubes connected to it. Leonardo arrives and tells his brother that he’s heard reports that the Shredder is back. Mike asks if they should go ask the Foot what’s up, but Leonardo reveals that he’s already been to their HQ and it looks like a bomb went off there. Leo then states that he’s going to hit the astral plane and attempt to contact Donatello. Mike decides to stay in reality keep watch on Don, since Shredder is back in town – he then hears a noise and draws his nunchakus, but it turns out to be Shadow, April and Casey. Casey and April asks what’s going on with Don, and Mike explains tha they’ve spent the past two weeks onboard Vanguard’s spaceship trying to keep Don’s body alive. The tank is filled wth “medicine” and now all they can do is wait and see if Don can recover his body. Just then, Leo awakes from his trance and calls out for Mike to help him. Elsewhere, we see Raph unconscious in bed and Master Splinter caged. Splinter is carrying rabies and he bit Raph, which has made the Turtle severely ill. Several Foot Soldiers are there as is a Foot healer, who explains that he will need the four Soldiers to help him save Raphael by giving up some of their life force. Raph arrives on the astral plane and sees Splinter choking Donatello. Raph threatens his former master and Splinter flies off in fear. Don recovers and explains that he hasn’t been able to find his way back to his body since Deathwatch attacked him. Raph states that his last memory was of being attacked and bitten by Splinter, and then he wonders if they’re both dead… just as Leonardo arrives. Leo tells Don that his body is safe with Mikey and all he needs to do is concentrate and he will be pulled back to it. Donatello does so, and his essence immediately zooms off into the ether. 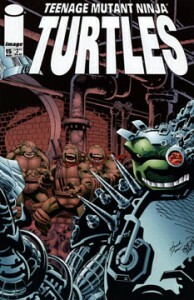 Leo then asks Raph what’s been going on with him, but Raph’s memory is a bit cloudy – he remembers the massacre at Foot HQ and the Shredder – as soon as Raphael mentions their arch enemy, Leo yells “Jackpot!” and asks Raph for details – but then Leo’s astral form suddenly jettisons away, leaving Raphael alone. In Mike’s apartment, Leonardo awakens… but now its Don who is trapped inside of his brother’s body! Don/Leo is exhausted and goes to sleep while Mikey monitors Don’s body. The next day, April delivers a letter from Horridus to Mike as he works on his romance novel. Two days later, Don/Leo finally wakes up and angrily tosses a radiator into the tank containing Don’s body, stating that he wants it back. The apartment is destroyed as thousands of gallons of liquid spill into it. Leo’s body sits up coughig and Mike demands to know why he did that. Leonardo explains that he didn’t do it – he’s been trapped in the astral plain for the past two days while Don inhabited his body. Leonardo states that he tried to get inside Donatello’s body, but he couldn’t do it, but once Don left his body, he was able to reclaim it. The brothers rush to Don’s prone body and find a heartbeat, but it isn’t breathing. Leo quickly begins giving his brother CPR, and after spitting out the chemicals in his lungs, Don awakens, although he’s groggy and feeling bad. Mike and Leo tell Don to take it easy and they begin to make plans to contact Vanguard so he can try to help Don recover now that the armor has abandoned him. As the two worry, Donatello stands up and asks them what they’re talking about, as his armor is fine. Leo and Mike are dumbfounded, since they saw the armor leave Don and attach itself to Lurch. Don tells them that the armor’s CPU is gone, and while the armor is harder to manipulate, he does have control of it. Mike wonders where Raphael and Master Splinter are and Leonardo explains how he was temporarily in his brother’s body – and while there, he saw both Raph and Splinter being held captive by the Shredder and the Foot Clan!